Two-sided printing is turned on by default on Mac for supported printers. This means all your print jobs can end up being printed on two-sides, in case you forget to turn off two-sided printing on your Mac. As mentioned above, the default behaviour in macOS is to automatically turn on two-sided printing in case a printer that supports Duplex Mode is connected to a Mac. However, not every document is suitable for two-sided printing. In-fact, most day to day use documents like school/college essays, homework submissions, resumes, air tickets and many other documents are mostly required to be printed on a single side. While it is easy to turn off “Two-Sided” option before printing documents, many users forget this and end up having their documents printed on both sides of the paper, which is not what they wanted. 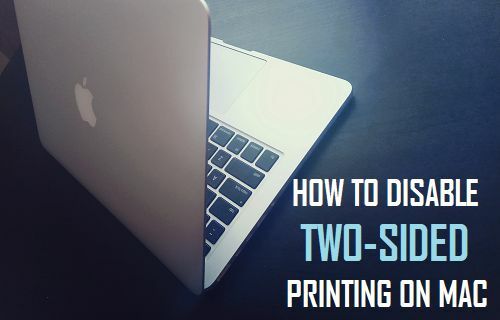 Hence, you are better off disabling two-sided printing on Mac, in order to prevent the possibility of paper, toner and your time being wasted by having to print the documents twice. In order to disable two-sided printing on Mac, you will have to first enable CUPS (Common Unix Printing System) Browser Interface on Mac. Once you are able to access CUPS, you will be able to make the required changes to disable two-sided printing on your Mac. As mentioned above the print setup on Mac is based on CUPS, an open source modular printing system developed by Apple for Unix based systems. CUPS interface is disabled by default in macOS. Follow the steps below to enable CUPS browser interface on your Mac. 1. Make sure that you are logged into your Admin Account on Mac. 2. 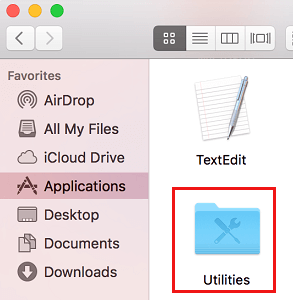 Click on the Finder Icon located in the Task-bar of your Mac (See image below). 4. 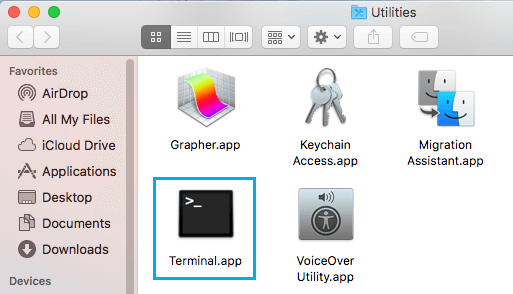 In the Utilities Folder, click on Terminal.app (See image below). Once this command is successfully executed, you will be able to access CUPS using any browser on your Mac. After enabling CUPS interface on Mac, follow the steps below to access CUPS Settings page and disable two-sided printing on your Mac. 1. Open Safari browser on your Mac. 2. Go to http://localhost:631 – This will take you to CUPS Settings Page. Note: Although you are accessing the CUPS Settings page via a browser, the page itself is not online. Whatever you are seeing is located right on your computer. 3. When prompted, enter the Username and Password that you normally use to login to your Mac. 4. 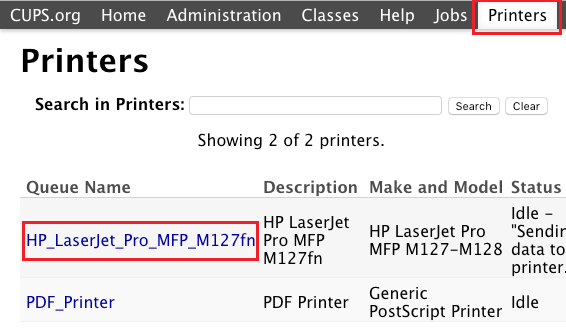 On the CUPS settings page, click on the Printers tab in the top menu bar (See image below). 5. You will see a list of printers. Click on the Printer for which you want to change the print settings. 6. On the printer’s configuration page. Click on the down-arrow next to “Administration” and then click on Set Default Options in the drop-down menu (See image below). 7. 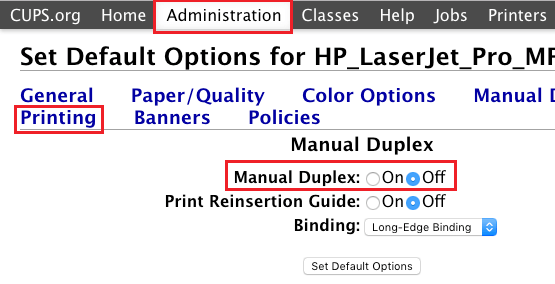 On the next screen, first click on Administration Tab, next click on Printing and then set Duplex Printing Mode to OFF position (See image below). 8. Next, Click on the Set Default Options button to save your changes. Now, close the browser and try to print any document. You will see that two-sided printing option is no longer enabled by default on your Mac. From now, you will no longer go through those frustrating episodes of having to discard two-sided print jobs and printing them again. Also, you will still be able to print on two sides, in case you want to.